The ReqIF Standard offers seven basic datatypes. Their configuration is described in the handbook. This example file contains those basic datatypes and contains a SpecObject Type that has eight attributes. 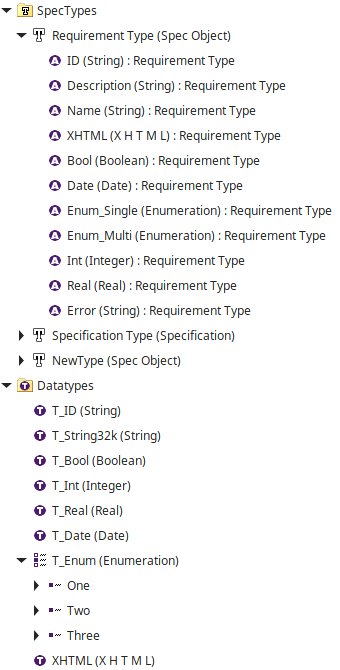 One more than datatypes, as enumerations can be "single value" or "multiple value." The video lecture on datatypes explains this file in detail. Make sure you have ReqIF Studio installed. Create a Project (see Handbook or Video). Download the file via the "Download" button above. Launch the import wizard via File | Import ... | ReqIF Studio | ReqIFz Import Wizard. Be sure to uncheck "Remove tool Extensions". Select an existing project, or create a new one by providing the project's name. Finish the import by clicking Finish. Open the project in the project explorer and double-click on Datatpye-Demo.reqif.